Nearly 90 percent of the earth's land surface is directly affected by human infrastructure and activities, yet less than 5 percent is legally "protected" for biodiversity conservation--and even most large protected areas have people living inside their boundaries. In all but a small fraction of the earth's land area, then, conservation and people must coexist.Conservationis a resource for all those who aim to reconcile biodiversity with human livelihoods. It traces the historical roots of modern conservation thought and practice, and explores current perspectives from evolutionary and community ecology, conservation biology, anthropology, political ecology, economics, and policy. The authors examine a suite of conservation strategies and perspectives from around the world, highlighting the most innovative and promising avenues for future efforts. Exploring, highlighting, and bridging gaps between the social and natural sciences as applied in the practice of conservation, this book provides a broad, practically oriented view. 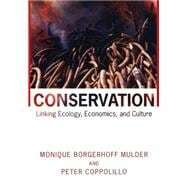 It is essential reading for anyone involved in the conservation process--from academic conservation biology to the management of protected areas, rural livelihood development to poverty alleviation, and from community-based natural resource management to national and global policymaking. Forest Islands in Guinea: Are They Man-Made? Room for Alliance, or Cover for Dalliance? International Policy Initiatives: Who Pays? Red Flags: Still Seeing Things in Black and White?